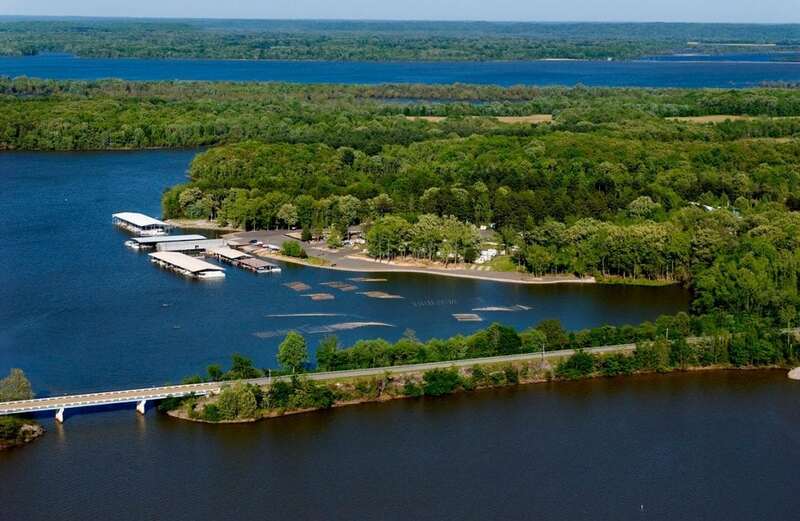 An aerial view of Birdsong Marina at Camden Kentucky Lake. If cruising America’s Great Loop is on your bucket list, look for Birdsong Creek’s flashing light and the sign at MM103.7 marking the Birdsong Resort, Marina and Lakeside RV Campground. Located on the south side of Birdsong Creek, 1.5 miles in the deep buoyed channel from the scenic Tennessee River—halfway between the dams on Kentucky Lake, Lake Barkley and Pickwick—seats the 58-acre recreational complex, family-owned and operated since 1961. Revel in true southern hospitality away from the daily grind while enjoying the greatest of the outdoors in western Tennessee’s Birdsong Marina. Onsite boat sales, engine repairs, prop sales, 140 covered slips—daily, weekly, monthly, and annual rates are available—ship’s store, and boat rentals are among the marina’s offerings. The resort also includes 26 cottages and lodges furnished with all the amenities of home. Transient cruisers may use the resort’s “courtesy car” for a trip into town for groceries or dinner with a vast choice of restaurants. Catering services (southern style barbecue, country breakfast and more) can be accommodated and served on site under the open-air pavilion—or delivered to your rental units. Revel in activities including fishing on the Tennessee River, home to more than 100 species of fish and famous for its crappie, bluegill, catfish, stripers, sauger, largemouth, smallmouth, and spotted bass. Artificial fish attractors marked by buoys have been built near all major creeks holding at least 10 feet of water. On land, stop by The Tennessee River Freshwater Pearl Museum, Farm and Tour to learn about North America’s only freshwater pearl-culturing operation and shop for some unique jewelry.